When you think of food and wood, usually you think about a wood fire pizza, a cedar plank cooked Salmon, or even a bamboo cheese board, but now you can eat it too! Just ask Top Chef Fernando Rivarola, who has edible wood on the menu at his Argentina based restaurant right now. Wood and bark are generally not suitable for humans to eat, although it would provide a decent amount of fiber, it’s not digestible. 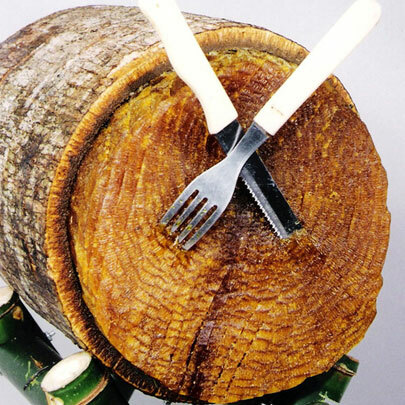 Recently however, there have been some culinary discoveries related to edible wood, including the Yacaratiá Tree. For the skeptical, this is not the tree bark or the inner core of a palm tree. This is the actual tree trunk of a tree that could reach 15 meters (50 feet) high. The edible wood is available in planks, sawdust and small rectangular pieces. 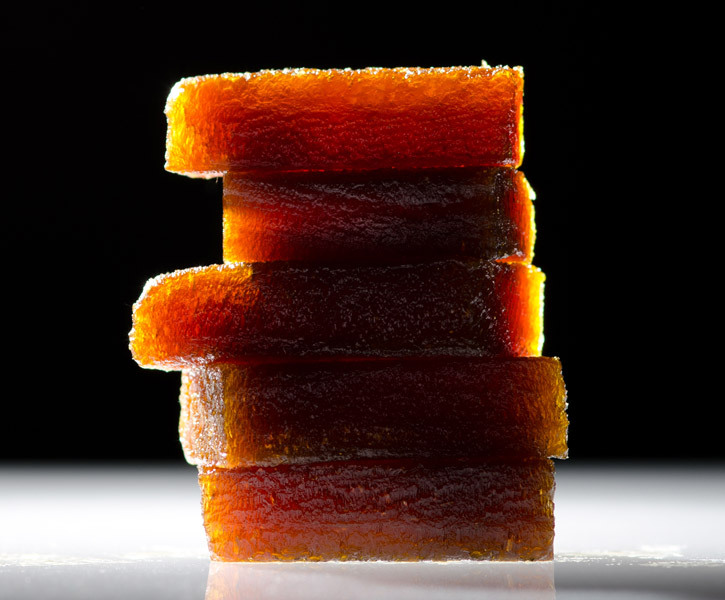 The edible wood is soaked in syrup or honey and is also available in flavored jams with sawdust or chocolate bonbons. Who Knew? There’s Edible Wood On the Menu! For now, Yacaratia is only available in Argentina. However, several Argentina based restaurants are already featuring it on their menus. 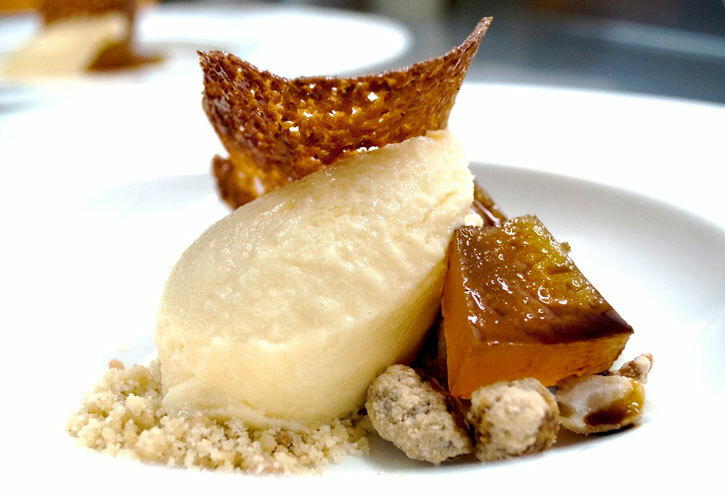 Chef Fernando Rivarola, from Bravo’s hit show Top Chef and owner of El Baqueano in Buenos Aires showcases Yacaratia wood in several of his menu items, including a lemon soup, a cream cheese, and even a cinnamon ice cream. 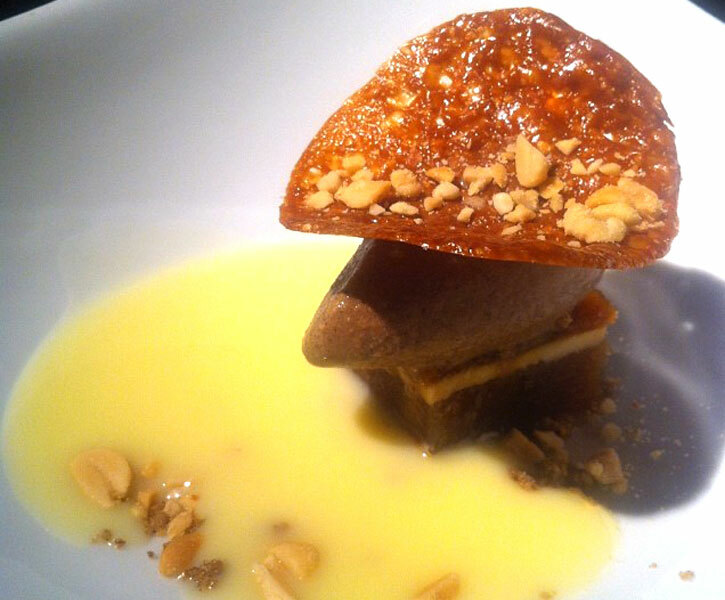 One of his desserts is cayote paste with a thin slice of cheese, a slice of edible wood, cinnamon ice cream, all topped with a peanut tuile. 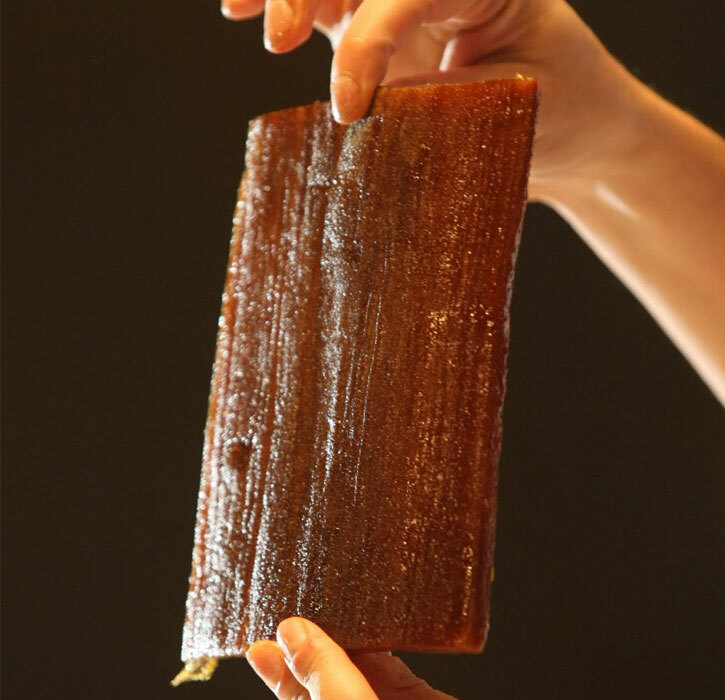 Because the wood has sponge like qualities, the natural sweetness mingles with the sweetness of the syrup it’s soaked in, making it an excellent chewy and sweet treat. 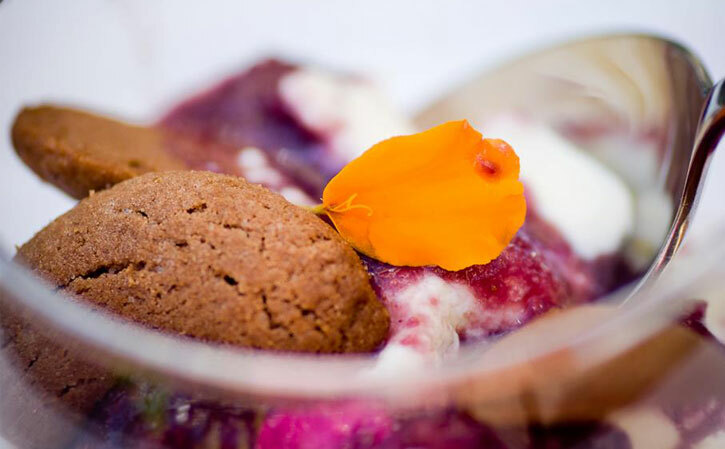 Herpan Gippono, a Palermo, Argentina based restaurant serves a Yacaratiá ice cream that is paired with goat cheese, plums and peanuts. Chef Gonzalo Aramburu includes edible wood in his dessert trio which comes in a shoe box and is presented with dramatic ‘smoking’ liquid nitrogen at the table. Other Argentinian restaurants like Lucca, an ice cream shop, are making things like goat cheese ice cream with chunks of Yacaratiá and almonds. Also, Chila chef, Soledad Nardelli, who compares the flavor to a chestnut, serves the Yacaratia plain with a selection of cheeses. The Yacaratiá edible wood is also used to make jam with sawdust and bon bons. It pairs perfectly with cheese and can be used as a “cheese board” that can be cut together with the cheese slice, yummy! It is interesting to serve the diner a small edible wood plank because they can easily see the wood grain and recognize it. 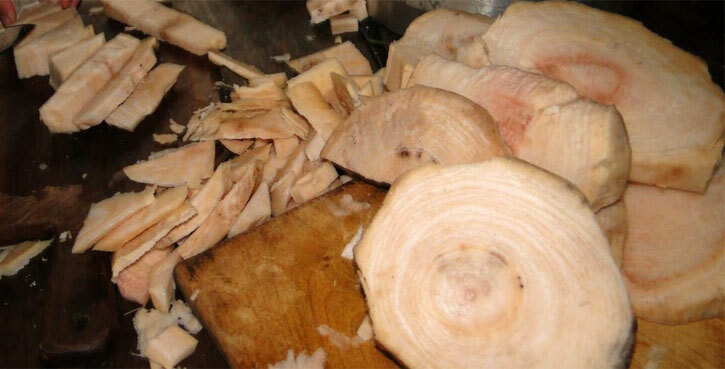 Other chefs have used edible wood in savory dishes such as crepes and stir-fried chicken in a wok. How does Edible Wood Taste? You are probably thinking eating wood may be disgusting but it has a nice texture and interesting flavors as long as you like sweet stuff. The edible wood is soft, soaked in syrup or honey and fibrous. Think about chestnuts in syrup, fig paste, quince paste and sweet potato or pumpkin in syrup. Edible wood is also packed with nutrients and it is a great source of fiber. It contains magnesium, calcium, potassium, phosphorus and fiber. The idea of making trees edible is not new to the food or science worlds. For years, scientists have been searching for a way to make trees and tree bark digestible and healthy for humans as a way to help solve food shortages. However, the cellulose found in a regular tree is inedible to us. It is too harsh, not tasty and humans can’t digest it. Professor Y.H. Percival Zhang, who studies biological systems engineering at the university’s College of Agriculture and Life Sciences, has recently developed a process that can transform wood chips, corn stems and other agricultural refuse into edible starches. Cellulose and starch have the same chemical formula - they are polysaccharides, which means their molecules are chains of glucose units, or sugars. The only difference is in their chemical bonds. Zhang uses enzymes to break the original bonds and then links the molecules back again to make a new bond that changes the coarse cellulose into powdery starch. The Yacaratiá tree is somewhat different. The cells that make up the tree are essentially pockets for water and nutrients, and its cellulose content is lower than in most woods. Using gastronomy methods to process the tree makes it palatable and delicious. It’s only natural that the world’s best and brightest gastronomy culinary experts would be the first to embrace the Yacaratia Tree and all it has to offer. The Yacaratiá Tree grows in the inner Parana Forest of Argentina in reforestation areas protected by tall pine trees. Its unique properties were discovered by modern man in the mid 90’s, although aboriginal ancestors knew about its properties and used it as a way to stay hydrated and maintain health. In the 90s, engineer Pascutti noticed that the Yacaratiá tree was the only tree not being used for anything and being discarded after it was cut down during the deforestation process to make paper. Pascutti then started a research project at the University’s Forestral Sciences lab in order to try to make the wood from the Yacaratiá tree edible. His research resulted in a patent to make edible wood and a company that commercializes edible wood, Yacaratia Delicatessen. 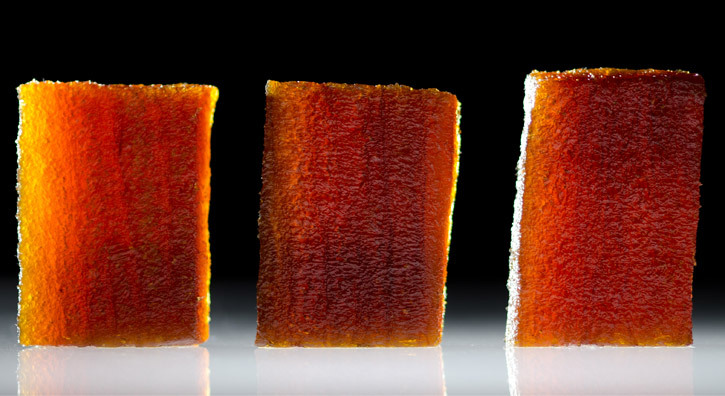 Let’s study plant cell walls to better understand the uniqueness of the Yacaratia tree and edible wood. Plants are made of primary cell walls and secondary cell walls. Primary cell walls are laid down during cell division. They are thin and flexible in order to accommodate cell enlargement but they strengthen when the cell matures and stops growing. Primary cell walls are composed of cellulose, hemicellulose and pectin. Secondary cell walls are present between the cell membrane and primary cell wall in some cells. 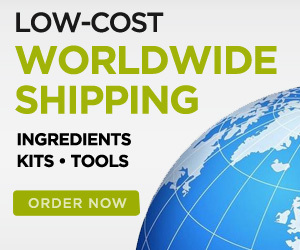 They are strong and durable and provide both cell protection and support. Secondary cell walls are composed of cellulose, hemicellulose and lignin. Key plant nutrients are distributed throughout the plant from cell wall to cell wall in what is called apoplastic flow. Wood is largely composed of secondary cell walls and contains the following proportions of cellulose, hemicellulose and lignin. 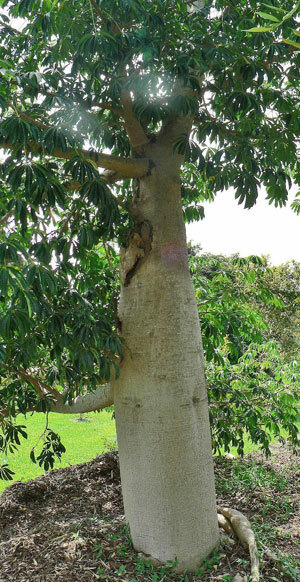 The Yacaratiá tree can grow up to 15 meters (50 feet) high. The wood of the Yacaratiá tree is different than other wood. Unlike other wood that typically has a cellulose content between 35-50%, the Yacaratiá tree is only 10% cellulose and the rest is composed of mostly water. Unlike other plant cells, the Yacaratiá tree’s cells have large spaces within the walls, which serve as deposits for water and nutrients. Also, the low density of the wood means that there is plenty of room to absorb glucose and sucrose. And the low content of lignin facilitates hydration and elasticity. All of these factors mean that the wood is not only edible, but also a great source of fibers and minerals. The high water content of the wood, along with the low lignin content, means that the wood spoils with only hours of being cut. In order to avoid this, the process to make it edible starts right away. Washing Process: Once the wood is cut into 3-4 ft. planks, the washing process starts immediately. The wood planks are steamed three times in large pots to remove its very acidic resin. Weakening Cell Walls: The wood is then cooked three times, at gradually higher temperatures, in order to weaken the cell walls. 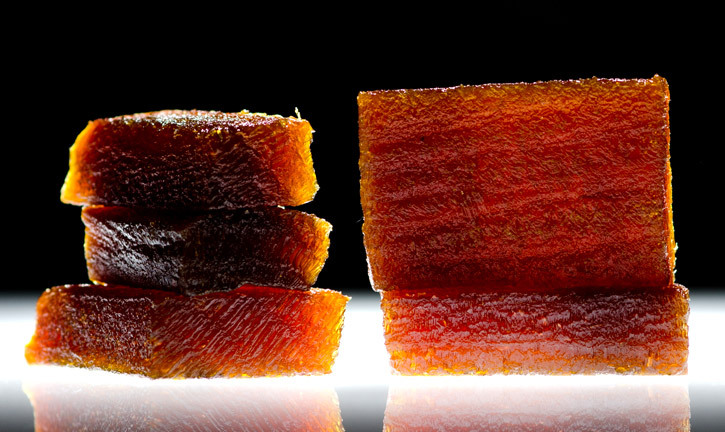 Last ‘Cooking’ Step: During the last cooking step, pectin, glucose, and sucrose are added to the liquid released from the tree to give the wood color, improve its texture and keep it preserved. This gastronomy process helps it retain its natural appearance but removes the unpalatable substances and makes it a delicious, nutritious edible product. Anyone ready for a trip to Argentina?